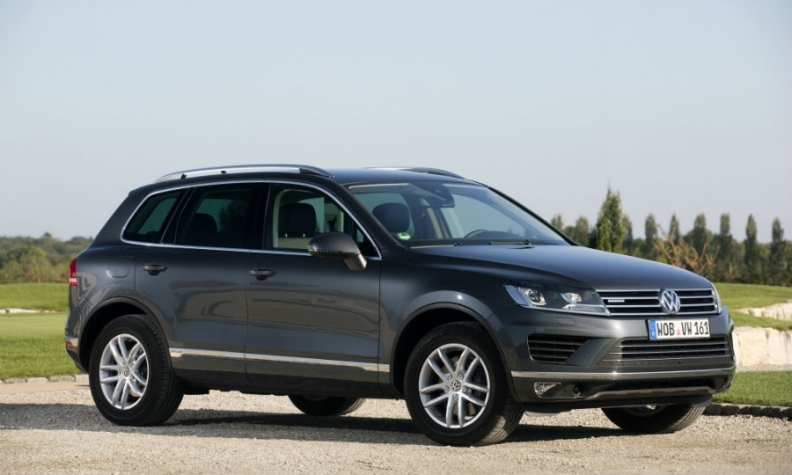 VW will give back 10,000 euros to buyers of a new Touareg. FRANKFURT -- Volkswagen Group is offering as much as 10,000 euros ($11,800) to drivers in Germany willing to trade in older diesel cars for a newer auto, intensifying a push to get aging vehicles off the road as the company’s emissions scandal evolves into an industrywide crackdown. VW Group's namesake brand and its Audi luxury unit are providing the most generous rebate programs, with as much as 10,000 euros ($11,800) off some models, according to company statements Tuesday. VW brand will give back 2,000 euros to buyers of a new Up minicar and as much as 10,000 euros toward a Touareg SUV, the division said Tuesday in a statement. The incentive applies to trade-ins of models from any manufacturer. Rebates at Audi range from 3,000 euros to 10,000 euros, and Porsche is providing a 5,000-euro reduction Europewide on models such as the the Cayenne SUV or Panamera sedan. Seat is offering up to 8,000 euros, it said in a statement while Skoda is providing as much as 5,000 euros. VW's commercial-van division is offering as much as 10,000 euros. The trade-in terms are valid through the end of the year for models meeting Euro 1 to Euro 4 emission standards, which have now been supplanted by Euro 6 regulations. VW’s sales chief, Juergen Stackmann, declined during a conference call on Tuesday to specify how much the incentives will cost, beyond saying they will involve a "substantial million-euro amount." The incentives are among pledges that German automakers made at a meeting last week with political leaders aimed at preventing large-scale limitations to a technology plagued by Volkswagen’s emissions-test rigging and wider air-quality concerns. VW, BMW and Daimler agreed to update pollution-control software on as many as 5.3 million diesel cars, a project estimated to cost 500 million euros industrywide, and to take trade-ins of older models that can’t be upgraded. Daimler’s Mercedes-Benz luxury marque is offering a 2,000-euro incentive Europewide on new diesel or plug-in hybrid autos while its Smart city car unit will pay 1,000 euros to buyers of an electric model. Customers can trade in autos from any carmaker that meet now-outdated Euro 1 to Euro 4 emissions standards. Daimler estimates that about 300,000 of its diesel cars with Euro 4 engines are on the road across Europe. If all customers returned to the manufacturer to replace those autos, that could cost Daimler some 600 million euros. BMW said a week ago that buyers who switch from an older diesel car to an electric model will receive as much as 2,000 euros back. Demand for cars with diesel engines is declining in several European markets as regulators step up scrutiny of emissions rules to improve air quality. Environmental advocacy group Deutsche Umwelthilfe, a fierce critic of diesel cars, won a court case last month seeking broad bans on the models in Stuttgart, the hometown of Mercedes and Porsche. VW CEO Matthias Mueller confirmed last week that the manufacturer is arranging software fixes for as many as 4 million diesel cars in Germany across all of the group’s nameplates, including about 2.5 million VW-brand cars that were part of a mandatory recall. Frankfurter Allgemeine Zeitung reported Tuesday that Porsche is looking at whether to stop offering diesel versions of its cars starting with the next generation of the Cayenne SUV, which it will unveil later this month. A decision hasn’t been made yet, a Porsche spokesman said by phone.